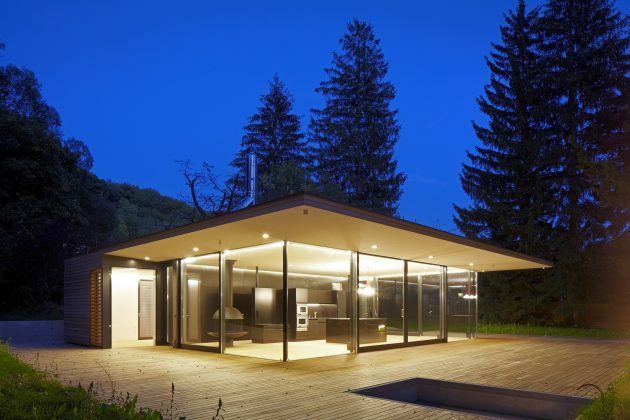 MOOSMANN architects have designed the Haus Hainbach in Vienna, Austria. It is a compact, 1,205 square feet single-story home that is surrounded by a lush green landscape and plenty of trees to go around. 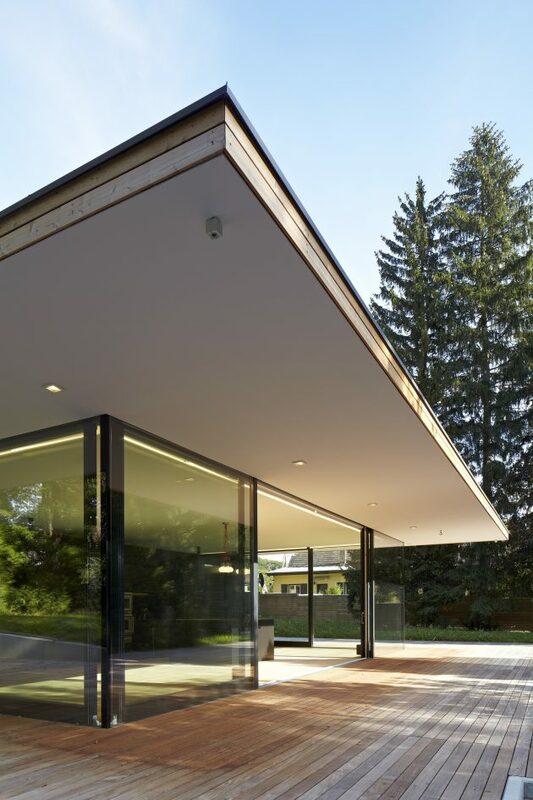 Its exterior design is formed by clean, distinctive lines and lots of glass surfaces that open the interior up to the beautiful natural surroundings of the house. The building is located on a large hammer-shaped plot in Mauerbach, directly at the border between Vienna and Lower Austria. The plot is bordered on two sides by two overgrown brooks with a large number of trees. The two other sides of the plot face detached neighbouring houses. Every effort should be made to preserve the existing trees, although the coppices do need tidying. The owners wished to build a bungalow for two occupants, to be constructed as a well-equipped, thought-out summer residence. The occupants will be spending the winter months in an inner-city penthouse. The building should have simple, clear and distinctive lines, with an open and easy-to-grasp layout. In particular, attention should be paid to the way the building would nestle against the large garden and to efficient sun protection. A basement was not required. The draft concept envisages two horizontal slabs (roof + floor) that are linked at the back by a wooden box. The elongated box defines the backbone of the house and accommodates all technical and functional rooms such as utilities, bathroom, WC and two bedrooms. The functional box is preceded by a large living area that is completely glazed on three sides, with the “black” kitchen constituting the central anchor point around which the dining area, the lounge area with an open fireplace and the hallway are grouped. The roof slab is largely “free-floating“, thus defining the lounge area with a panoramic view of the garden on three sides. 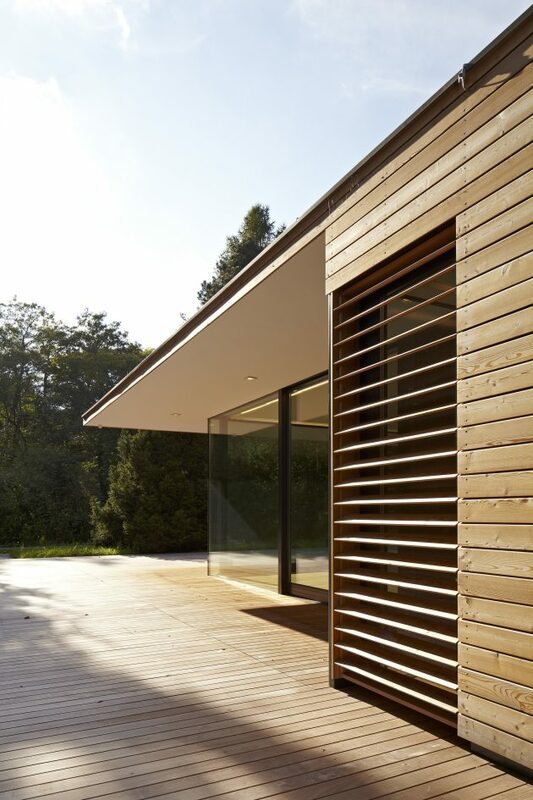 The large glazed areas let the garden into the lounge from any point in the room and whatever the weather. The 4-meter double sliding door in the middle of the main front opens the lounge area to the terrace. The entire house is surrounded by a 244m² wooden deck made from Ipe hardwood and the deck then expands into the generously spaced terrace on three sides of the lounge area. The wooden roof slab with a “green roof” serves as the architectural counterpart to the terrace slab which extends over the terrace by 2.5m on three sides, providing structural shade for the large glazed areas and allowing the use of the terrace even on rainy days. 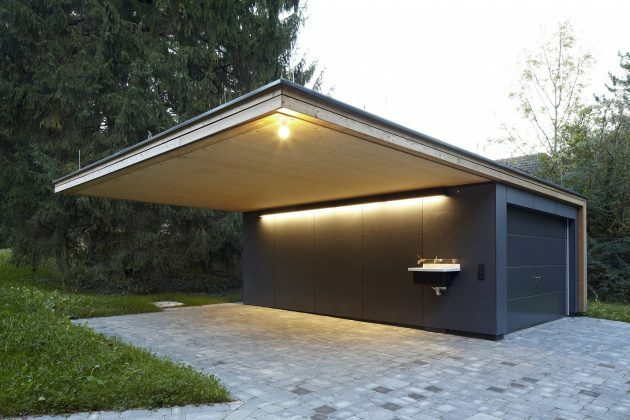 The green roof also constitutes an excellent heat buffer for the flat roof, in addition to the projecting roof creating a large, shady seating area on the terrace, just outside the three-sided lounge area.